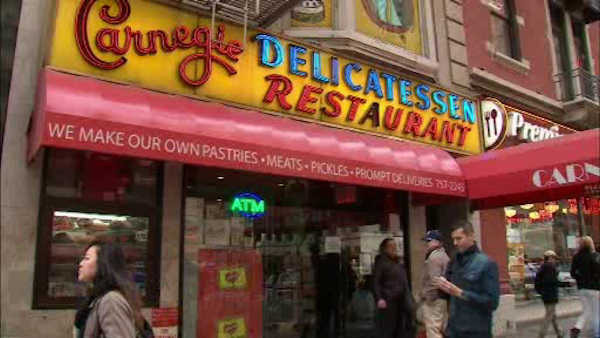 MIDTOWN, New York (WABC) -- To some it may be trash, but to fans of the recently closed Carnegie Deli, it's an opportunity to own a piece of its history. On Wednesday night, the framed signed photographs of celebrities and dignitaries that once adorned its walls were left in a box outside the iconic eatery on 7th Avenue and West 55th Street. The owners of the deli said they left these mementos outside on the sidewalk for anyone to take as a way of doing something nice for the people of the neighborhood. The photos of the celebrities that have dined there had taken up nearly every available space along the walls inside. The famous deli had been open for nearly 80 years before it served its last sandwich a few weeks ago at midnight on December 31st. Licensed branches in Las Vegas, Bethlehem, Pennsylvania, and at Madison Square Garden, along with its wholesale distribution service remain in operation.